A Coiba National Park cruise takes visitors on jungle treks among chattering monkeys, kayaking along pristine beaches, and to some of the best snorkeling and dive spots in the world. Located off Panama’s Pacific coast in the Gulf of Chriqui, Coiba National Park is Panama’s most remote national park and encompasses thirty-eight islands, including lovely Granito de Oro and Isla Coiba, the largest island in Central America. A wildly biodiverse region, cruises to Panama’s Coiba National Park offer visitors the opportunity to swim, snorkel or dive in an underwater environment that has been described as the best place in the world to discover new marine species. The site of the largest coral reef in the Eastern Pacific, it is believed that nearly half of marine life inhabiting Coiba is unknown to science. But wildlife encounters on a Coiba National Park cruise are not limited to the sea, as treks through jungle forests will reveal varied land animals, including sloths, scarlet macaws and several species of monkey. Isla Coiba is still known to Panamanians as their version of Devil’s Island. Once the site of an infamous prison and now thought to be haunted, Isla Coiba’s fearsome reputation served to scare off would-be developers, leaving it largely untouched and an ideal nature reserve. Fully 75% of the island’s surface consists of lush mangrove forests and is home to numerous endemic species, including the Coiba howler monkey, Coiba agouti and Coiba spinetail. Isla Coiba is also the site of large colonies of scarlet macaws. Meanwhile, its waters and spectacular reefs are populated by sea turtles, eels and several species of shark, including the spectacular whale shark. Granito de Oro is a small island off the northeast coast of Isla Coiba and one of the most popular stops on a Coiba National Park small ship cruise. The island is best known for its white sand beaches, cradled by volcanic rocks that merge with the nearby reefs. It’s a prime spot for kayaking or paddleboarding above the waves, while those visitors seeking underwater exploration can enjoy what is considered the best snorkeling in Panama. Here, the waters are home to sea turtles, eels and nurse sharks, along with clouds of small, colorful fish. Coiba National Park is especially popular with adventure cruises given that it allows for exploration and wildlife encounters on land and within the Pacific Ocean. It is known as one of the best snorkeling spots in Central America and has been named one of the top ten scuba diving sites in the world, due to its spectacular marine life, including sea turtles, jacks, snappers, barracudas, seahorses, eels, five species of ray (devil, angel, mobola, cow-nose, manta), numerous species of shark (including hammerhead, bull, tiger, nurse, white-tip, whale), and humpback whales. Meanwhile, Isla Coiba includes several trails perfect for hiking excursions. The Hot Springs Trail features lush forest brimming with hummingbirds, scarlet macaws, howler monkeys, white face capuchins and Coiba spinetails, and ends at thermal pools where visitors can soak their tired feet. The Gambute Peak trail leads visitors up a steep path to absolutely spectacular views of the island and surrounding waters. Along the way, keen-eyed hikers can spot monkeys, woodpeckers and king vultures, soaring high overhead. Bring sunscreen and sunglasses as Panama is hot and sunny. Snorkeling gear is often provided, but bring your own to ensure availability and proper fit. A good camera and binoculars are recommended for whale and bird watching. There truly is no best time to take a Coiba National Park cruise as Panama’s weather is temperate with fairly constant temperatures of 30 degrees Celsius (86 degrees Fahrenheit) year-round. But plan ahead as there are better times of year to see wildlife. Coiba National Park in December to April is the dry season and often regarded as the best time to visit, though it is also the busiest and often most expensive period. March to early December in Coiba National Park is the wet or so-called “green” season, when the weather is still warm but rains are more frequent. 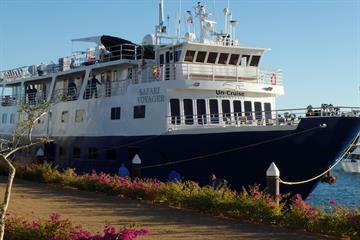 Prices may be lower during this season, but some Panama cruises may not be available. Hammerhead and whale sharks can be seen year-round, but some months offer the best opportunities. June to September is the best time to see whale sharks. July to October is best to see humpback whales. From November to April, hundreds of hammerhead sharks flood the area. Where do Coiba National Park cruises depart from? Most Panama small ship cruise to Coiba National Park depart from Panama City’s Flamenco Marina, serviced by city’s Tocumen International Airport. The airport is served by international airlines. Note that Costa Rica to Panama cruises that include Coiba National Park on their itinerary may depart from Puntarenas or Herradura in Costa Rica. If your cruise departs from Puntarenas or Herradura, you will likely fly into San José’s Juan Santamaria International Airport and transfer to your point of departure. Please contact our reservations team to book your next adventure cruise to Coiba National Park, Panama.